Painting & prints of Glencoe - The Aonach Eagach Ridge, Glencoe, Scotland. Glencoe Painting & Prints – The Aonach Eagach Ridge, Glencoe, Scotland. An original painting and prints of The Aonach Eagach Ridge, GlenCoe, Scotland. An original abstract, atmospheric landscape painting of The Aonach Eagach Ridge, Glencoe, Scotland. A mix of mediums are blended, layered, sprayed, scraped and splattered over the canvas to produce a very unique & atmospheric painting, depicting the ever changing weather, shadow & light that sweeps across the Glencoe area. I love to combine & layer different types of paint & application of mediums including spray paint, oil paint, acrylic paint & others, creating a unique style of atmospheric painting full of vibrant colour & drama. The painting continues around the deep edges of the canvas giving a very contemporary style although it can be framed if you wish. More about the Glencoe here. 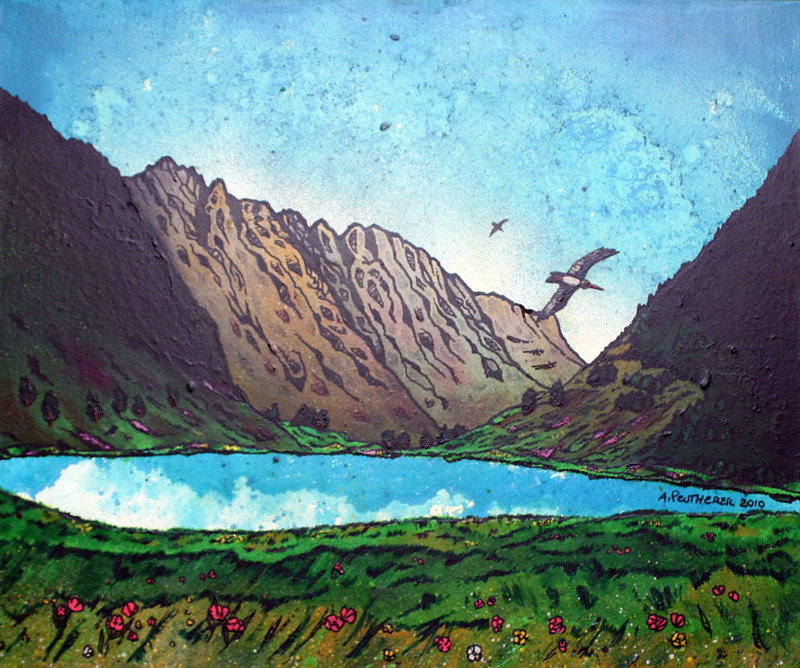 Paintings & prints of The Aonach Eagach Ridge, Glen Coe, Scotland by Andy Peutherer. Glencoe Painting & Prints - The Aonach Eagach Ridge, Glencoe, Scotland. Mull Paintings & Prints – Mull Sunset From Ganavan, near Oban, Scotland. Scottish Highlands Paintings & Prints – Across Loch Torridon.2, Scottish Highlands. Oban Paintings & Prints – Oban Bay Sunset, Scotland. Loch Awe from The Ardanaiseig Hotel, Kilchrenan by Taynuilt Scottish Highlands. Scottish Highlands Paintings & Prints – Ben Nevis Across Loch Linnhe, Scottish Highlands.